It is positive sign that US and India have joined hands for trade, defence, technology and education, said Robert G Burgess, US Consul General (Chennai). Burgess who was the chief guest at the Golden Jubilee celebrations of Indo-American Chamber of Commerce (IACC) here, said that the American Universities have opened the doors for the students of Kerala. 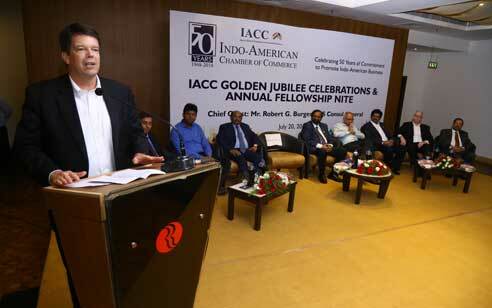 IACC had played a major role for trade between the two countries, he said. District collector K Muhammed Y Safirulla IAS, who was the special invitee at the function, said that IACC was able to pave the way for the industrial development of both the countries. He also pointed out that Kochi is one of the five best destination for investments in the country and hoped that more industrialists is attracted to the investor friendly state. P Ravindranath, Chairman, IACC Kerala, said that Kerala is in the development path in various sectors including tourism, IT, health, higher education, agriculture products, seafood and construction. Kerala is expecting more investments from US in the future, he said. S Purnachandra Roa,, Regional President, South Indian Council, IACC, Venugopal C Govind, Founder Chairman, IACC Kerala, Dr Viju Jacob, National Executive Council Member, IACC Kerala, James F Flucker, Commercial Consul, US Consulate, Chennai and Sajiv K Menon, vice chairman, IACC Kerala,spoke.